Bushnell Binoculars — Affordable Optics Expertly Reviewed. Bushnell Binoculars. Affordable Binoculars for Over Five Decades. The seeds of the Bushnell binoculars company were sown in 1947 when a 34 year old David Bushnell was about to leave California to deliver a load of steel to Hong Kong via ocean liner. He didn't know what to call them, but he wanted to have one of those things to hang around his neck like the tourists had. Binoculars were scarce immediately following World War II and he felt lucky to buy a used 6X30 for $50 at a pawn shop. While en route to Hong Kong, the ship stopped in Manila and someone on the dock offered to buy them for $100. It was Bushnell's first binocular sale. In Shanghai, he met a man who showed him a 7X50 binocular he had bought as a sample in Japan for $18. Because he had been importing and exporting before the war, Bushnell was able to get a permit from Washington to visit postwar Japan — where he established contacts which enabled him to begin what was to become the Bushnell binoculars empire. The first of this famous brand were made by Asahi Optical under the brand name Hercules. Through astute research of consumer needs and wants, Bushnell had binoculars made to specifications for both stadium sports fans and outdoors enthusiasts. These binoculars became favorites, quickly earning a place in many homes. By the mid-1950s, Bushnell's binoculars were selling well and he was beginning to make regular trips to Japan to meet manufacturers and discuss specifications with them. By 1971, Bushnell binoculars were selling at the rate of 10 million per year. Bushnell continues the legacy by producing optics in various designs and at many price points. Bushnell guarantees that their instruments, other than the ImageView and StableView which include electronic components, will be free of defects in materials and workmanship for the lifetime of the original owner. It's a "limited lifetime warranty" and it's a good one. Unless otherwise noted, the roof prism Bushnell binoculars noted below have phase coating and all of them are fully multi-coated and use BaK-4 glass for their prisms. All of the waterproof/fog-proof These binoculars are purged with nitrogen to remove potentially moisture-laden air molecules prior to sealing with O-rings. Finally, all the Porro prism design Bushnell binoculars listed below have prisms made of BaK-4 glass and are fully multi-coated unless otherwise noted. Frustrated because you can't find the interpupillary distance (IPD) for Bushnell binoculars you're thinking about buying? Stick with OpticsReviewer.com because we give the IPD for each of the models we list below — either on this page or on the page devoted to that particular model. The Bushnell Excursion EX is a waterproof/fog-proof roof-prism binocular available in both mid-size and full-size configurations. Bushnell literature says the chassis is from composite materials. When we asked a Bushnell binoculars spokesman what that meant, the answer came back that the chassis was the strong, but lightweight, magnesium. The twist-up eyecups will contribute to ease of use in the field, although the Excursion EX diopter adjusting ring does not lock in place. The Excursion EX Bushnell binoculars have a feature not found on many binoculars — its focus wheel locks. You pull up on the wheel to adjust the focus and push it back down to lock it in place. Why? This makes it easy for someone monitoring a specific area for activity to keep a sharp focus for that area. It's even handier, though, when passing your binocular back and forth in a group or (especially) when sharing a view with kids! The interpupillary distance measurements in the table below are courtesy of a Bushnell representative who, when we asked about them, very kindly and graciously looked them up and provided them. We hadn't been able to find them anywhere and we know how important such information can be! Bushnell binoculars' Excursion EX model is available from Amazon.com and Amazon.co.uk . We weren't able to find any published values for the Bushnell Marine binocular's interpupillary distance measurement. Knowing how important that information can be when finding a binocular that "fits," we asked a Bushnell spokesman who provided it very graciously. 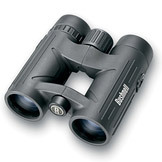 Bushnell binoculars' Marine model is available from Amazon.com and Amazon.co.uk . Bushnell StableView binoculars are image stabilized binoculars with a vertical stabilization in "Fine" mode of up to 1° and up to 3° in the "Normal" operating mode. The normal mode would be used, for example, for operating from a moving vehicle/vessel/plane and the fine mode would be good for reducing small, normal body movements which tend to blur details at higher magnifications. The Bushnell binoculars' StableView model has fully multi-coated optics, prisms made of BaK-4 glass, twist-up eyecups, and a center-focus mechanism. The power supply for the StableView requires just two AA cells, which are readily available nearly anywhere in the world. The StableView is waterproof, but we would encourage you not to tempt fate and suggest that you avoid getting it wet if possible. As is the case with most electronic goods, the image-stabilized Bushnell binoculars have a two year limited warranty which provides for them to repair or replace, at their option, a binocular in which a defect in materials or workmanship becomes known — you'll only pay $10 to cover shipping and handling. 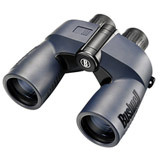 As of 2012, a friend with the company advises that the Bushnell binocular lineup will no longer include the StableView. Bushnell is not filling dealer orders for the StableView and availability is limited to the stock a dealer has on hand. Sources tell us that, under the skin, the StableView is remarkably similar to the Fujinon TechnoStabi image stabilized binocular and the StableView is manufactured alongside the TechnoStabi instruments. If you're in the market for an image stabilized binocular, you'll probably want to see if closeout pricing is available on the StableView member of the Bushnell binoculars' lineup. Our readers sometimes wonder "Where is it possible to buy Bushnell binoculars?" Our response is to send folks to the best online optics dealers we're familiar with. 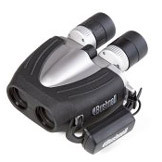 We tell our friends who are shopping for Bushnell binoculars to check Amazon.com in the United States, and Amazon.co.uk in the United Kingdom and South Africa. For Bushnell Legend Ultra HD binoculars purchased outside of the United States and Canada, you'll want to contact the dealer where you purchased the instrument.